It’s estimated that 100 millions Americans suffer from some form of chronic knee pain, and that number is on the rise. A study published in the Annals of Internal Medicine found that knee pain increased by a whopping 65 percent between 1974 and 1994, and these statistics certainly haven’t improved in more recent years. If you’re one of the millions of Americans suffering from knee pain, you know full well that it can really get you down. Regardless of the cause, knee pain can not only prevent you from doing the things you love, but dramatically impede basic functions like sleeping or walking. If you want your life back, you need to get that knee pain under control. The logical solution is to either approach your doctor, or take a trip down to the local drug store. In either scenario, you’ll invariably end up with some form of acetaminophen-based painkiller like Tylenol, or a non-steroidal anti-inflammatory drug (NSAID) like aspirin or ibuprofen. While these might bring you a little relief from the pain, over time they can introduce negative side-effects that often make your life even worse than it was before medicating. Known side effects of Tylenol, for example, include stomach pain, appetite loss, itching, rashes, headaches, discolored urine, and even jaundice. Would you be willing to trade your knee pain for any (or all) of those? Similar to acetaminophen, ibuprofen painkillers also commonly result in central nervous system side effects, gastrointestinal upset, intestinal perforation and inflammation, and blood loss complications. Not ideal. Luckily, however, there’s a slew of natural, side-effect-free treatments for knee pain already lying around your home. 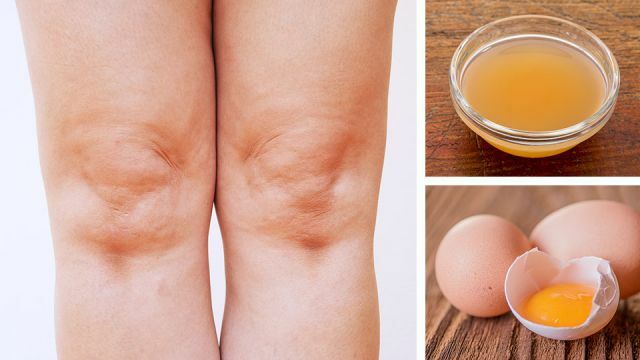 Apple cider vinegar, eggs, ice and even mustard oil have all been used to provide fast, effective relief from knee pain, without all the nasty complications of anti-inflammatory drugs. At first, the notion that egg yolks might help reduce swelling and pain in your knees might seem more than a little absurd. Surely it’s just another hyped-up “natural remedy” that’s sweeping the net with no real proof? Those were my exact thoughts, but then I started doing some research. It turns out that eggs actually contain high concentrations of collagen, particularly in the yolk and in the shell membrane (that colorless glue-like stuff on the inside of the shell). And collagen, as most people know, is one of the best ways to improve joint mobility, reduce swelling, and alleviate pain. In a study where patients suffering from rheumatoid arthritis (a common cause of knee pain) were given type 2 collagen from chickens, almost all had significant improvement in symptoms and 4 patients had complete remission from the disease. In a more recent study, patients with osteoarthritis of the knee showed a 40 percent improvement in their pain and other symptoms after 90 days of supplementing with undenatured type 2 collagen — a better result than many other common drug treatments. The issue is that for the most part, these joint-supporting collagen proteins in eggs are denatured when we cook them. But rather than advising you to go raw food-styles and start downing uncooked eggs, there’s an easier solution: put them directly on your knees! To make a powerful natural knee pain remedy, crack open a free range, organic egg and separate the white from the yolk. Next, scrape off the membrane from the inside of the eggshell — remember, this contains plenty of collagen too! Mix the membrane and the egg yolk in a small bowl, along with a pinch of unrefined sea salt or Himalayan salt (unrefined salt contains muscle-relaxing magnesium and other essential minerals) apply to the affected knee and seal it in with some cling film. Leave the paste on for up to two hours, and repeat several times a day until the pain recedes! Another unlikely natural remedy for knee pain is apple cider vinegar (ACV). ACV contains high concentrations of acetic acid, a compound known to boost calcium absorption and promote internal alkalization once metabolized. Not only that, ACV contains several potent antioxidants, including phenolic compounds like quercetin, catechin and chlorogenic acid that can help to alleviate inflammation and thereby reduce swelling in inflamed joints. Thus while there’s no direct evidence linking apple cider vinegar to knee or joint pain treatment, there’s enough science behind the claims to make it worth trying. My personal approach would be to simply drink at least 1 to 2 tablespoons of raw, unfiltered,100 percent apple cider vinegar in water once or twice a day. You can possibly increase the healing power of ACV by also soaking a cloth in raw ACV and securing it around your knee to allow the ACV to soak in for 15 to 30 minutes, twice a day. Mustard oil is a common ingredient in Asian cooking, and also just so happens to be a popular natural remedy for a wide range of ailments in that part of the world. More recently, however, scientists have begun to study its potential as an anti-inflammatory agent. In a 2014 study, researchers found that massaging warm mustard oil into inflamed knee joints helped to reduce pain from moderate to mild, and discovered that combining the mustard oil massage with camphor oil helped to further alleviate pain. Curcumin, the active ingredient in turmeric that gives it that wonderful deep orange color, is one of the most intensely studied natural remedies on the planet. As far as inflammation goes, curcumin’s powers are virtually unrivaled: oral curcumin supplements have been shown to dramatically reduce osteoarthritis-related knee pain and has shown strong anti-inflammatory activity across hundreds of studies. The easiest way to harness the knee-soothing powers of curcumin is simply to invest in a high-quality curcumin supplement. If that doesn’t float your boat, simply ensure you’re getting plenty of turmeric in your diet — whether fresh or dried, it makes for a great spice, so there’s really no excuse! Hey Buddy!, I found this information for you: "How To Use ACV And Egg Yolks For Knee Pain". Here is the website link: https://www.thealternativedaily.com/use-acv-egg-yolks-knee-pain/. Thank you.